Exfoliation: Does It Really Do a Body Good? Exfoliation is a practice that beauty buffs and dermatologists the world over deem essential to a good skin care regime. The process involves removing dead skin cells that sit on the skin�s top layer (the epidermis) to reveal softer, smoother skin below. Results of exfoliation can be impressive: the reduced appearance of fine lines, clearer, brighter skin. Studies also show that exfoliation can significantly improve the efficacy of skin care maintenance products. Firstly, do you actually need to exfoliate? If it ain�t broke, honey, don�t fix it! Some of you are blessed with clear, radiant, even-toned skin that looks supple with or without moisturizer. You have few or no breakouts. If this is the case - congratulations! Chances are you don't need to exfoliate. Does your skin look dull or ashy? Do you have hard-to-move dark marks and uneven skin tone? Are you bothered by photo-aging and fine lines/wrinkles? If you have answered �yes� to the last three questions, read on. My advice to anyone who wants to exfoliate � especially their facial skin � is to first consult a good dermatologist (if their budget allows) - and I mean visit a medical practice, not a spa, unless the spa has a resident dermatologist. Attempting to treat your own skin problems can be a wasteful, costly and demoralizing exercise. As women of color, we are more prone to large pores, oily skin, and hyperpigmentation. Many home remedies/over-the-counter exfoliation products can irritate, rather than ameliorate, these conditions. The Doctor�s Experience in Treating Patients of Color Get recommendations wherever possible. Treatments that may give fantastic results on Caucasian or Asian skin may be detrimental to Black skin. Ask to see �Before and After� photographs of patients of color who have had the exfoliating treatments you are considering. Your Health Any good dermatologist will advise you here, but if you have extremely sensitive skin, diabetes or bacterial infections, do not have a microdermabrasion treatment. The Treatments Available Dermatologists typically offer microdermabrasion (informally referred to as a �micro-d�). The most modern technique is the diamond tip micro-d, which is less abrasive and allows greater user-accuracy. The best microdermabrasion treatments also include the use of water and oxygen to restore the skin during the process. Ask which techniques your dermatologist uses. Be aware that chemical peels (where a chemical is applied to the skin, causing it to blister and eventually peel off revealing softer, smoother skin below) can be extremely strong; and generally, should not be encouraged as a first option. Your Skincare Budget Your dermatologist may not only suggest a micro-d every six weeks, he/she may also recommend a host of maintenance products to optimize results. If you cannot, or do not wish to, buy all that is on the list, I recommend you purchase one product, if no other: a UVA/UVB sunscreen. After a micro-d, you have removed a protective layer, as well as unwanted dead cells. For black skin, to prevent repeat hyperpigmentation, it is essential that post-microdermabrasion, you avoid the sun and routinely apply that sunblock. 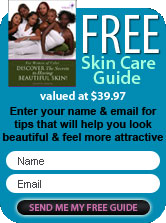 Don�t buy exfoliators that contain ground nuts (they are too coarse and damaging to black skin). Don�t buy exfoliating facial cleansers that contain micro-beads, salts and ground nuts. Look for one that contains glycolic acid � it does the job gently. Don�t over-exfoliate � you can disrupt the skin�s natural equilibrium causing excessive sebum production. We don�t need any help with oil production! You need exfoliate no more than once every seven to ten days. Never use body exfoliators on your face. Don�t do double duty: some folks swear by facial brushing, some folks swear by a rinse-off exfoliator, some folk swear by an AHA cream; but don�t do all three, all the time � it�s too invasive and may lead to irritation and further hyperpigmentation. If you are prone to acne or other common skin conditions, read the fine print. Fragrance, or the presence of cucumber, for example, may exacerbate the problem. A Beta hydroxy acid (BHA) exfoliant is preferable for treating blackheads and whiteheads because BHAs can better penetrate pores (which contain sebum) and exfoliate the dead skin cells in them. Alpha hydroxy acids (AHAs) are better used on thickened, sun-damaged skin where breakouts are not a problem. Firstly: bypass your neck. Its delicate skin doesn't usually need exfoliation (especially the massage-in, rinse-off kind). Fine lines can be improved with a low-grade AHA product. Try daily dry body-brushing with a soft natural-bristle brush. Brush in upward, gentle, sweeping motions from your feet up to, and including, your breasts. Include your back and arms. Follow with a rich moisturizer. And don�t forget your hands! Use a washcloth, sponge or exfoliating glove to apply your regular body wash/shower gel in circular motions. Look for sugar or fine salt-based body exfoliators (but again, avoid nut-based ones); feel free to add a tip of your favorite moisturizer or essential oil. Again � don�t over do, and remember: from head to toe, protect and moisturize after exfoliating!